Reliance Jamnagar Marine terminal is located in the Gulf of Kutch, State of Gujarat, India about 35 km west of the city of Jamnagar. 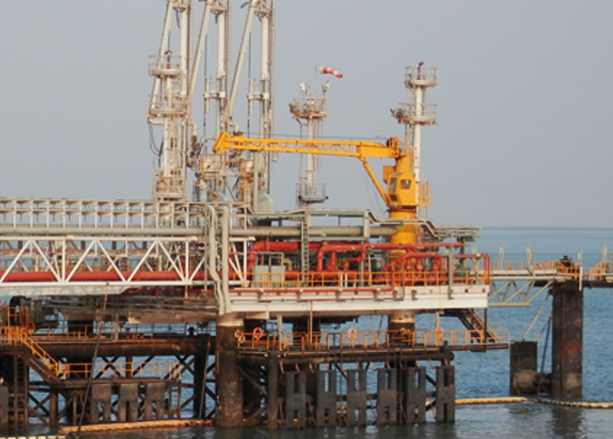 Berth A1 is provided with three loading arms for handling HSD, MS, ATF, PX, OX and Methanol. (for HSD, MS and ATF two loading arms and PX, OX and Methanol one loading arm). The new Berth A1 is constructed with the facilities as described below. The Berth A1 is designed for berthing of vessels size of 195 m LOA and 11.5 m draft maximum. The Berth A1 is a four legged platform provided with operating deck made of concrete supported on steel structures and steel piles. The operating platform is 24 m x 21 m at 11 m C.D.